My friend Anja just started a new blog called A Suitcase Full of Mangoes. The first recipe I am going to try is himmel und erde, a German mashed potato dish. This is so exciting because I am always on the lookout for ethnic dishes for my husband who is half German. The himmel is heaven (apples) and the erde is earth (potatoes.) 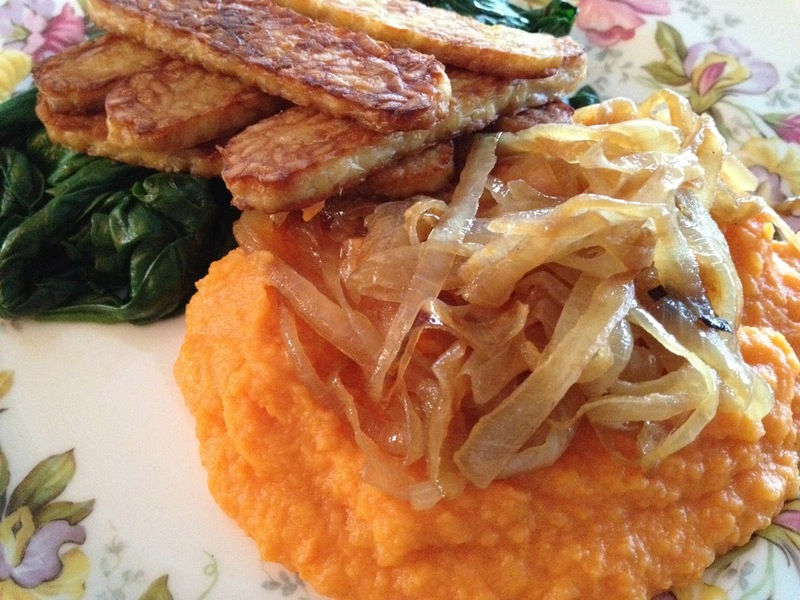 A great side dish for basic tempeh and spinach! Slice the onion into semi-circles. Place in a saucepan with a drop of oil and caramelize until brown, about 30 minutes. Peel and chop the apples and sweet potatoes. Cover with water in a saucepan and cook until soft. Drain and mash with oat milk and Earth Balance until creamy. (Start with a small amount of oat milk and Earth Balance and add as necessary.) Season with lemon juice, sugar, and salt. Taste and adjust. Cut tempeh into thin strips. Steam for 15 minutes and drain. Heat sunflower oil (or any high heat oil) in a non-stick skillet and brown on each side. Use the onion pan to wilt the spinach with a dash of salt. Plate it up and enjoy! luke loved it! and so did paul. none left!